There's nothing better than walking around with a fitting pair of flats and the new Pretty Ballerinas Fall/Winter 2018 collection with Alessandra de Osma, is continuing the glitzy art of footwear, with fashionable and adorable styles that will leave you captivated. 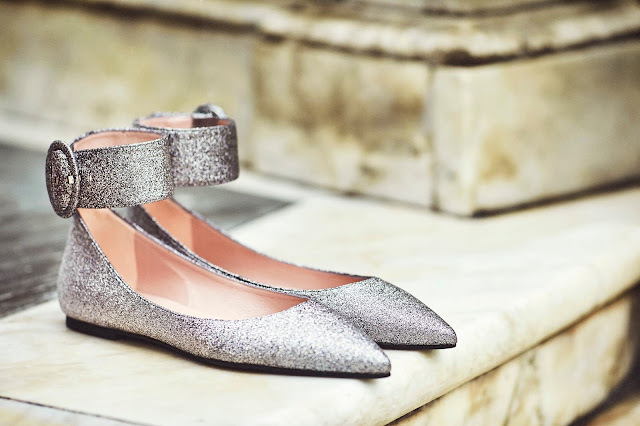 "Pretty Ballerinas x Sassa de Osma" is the name of the collaboration between the Peruvian aristocrat and Pretty Ballerinas where she chose and wore her favourite shoes fromthe Fall/Winter collection to represent moments from her life. Hence, the new collection features elements of Alessandra's momentous wedding with designs such as fringes in different colours, representing the four facets of a Pretty Ballerinas lady (pink for feminity, black to be taken seriously, red for danger and hot pink for sexiness), silver and gold glittery flats that make it perfect for upcoming holidays. Also there's a mix of the trendy animal print with punky studs, creating a tough love for this fall. Lastly, other than fringes, the collection also comes with soft fluffy pompoms that makes you want to cuddle your toes every now and then. Pretty Ballerinas x Sassa de Osma collection price ranges from RM 799 to 959, and now is available at The Gardens Mall and Suria KLCC. For more info check out their site here.